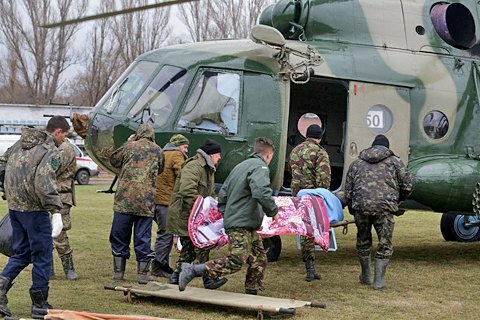 Thirty-five shooting attacks by militants were registered. One Ukrainian serviceman was killed, three wounded and six injured in combat in Donbas on 30 June, the antiterrorist operation (ATO) HQ said in its update the following morning. Pro-Russian militants intensified firing attacks in the western suburbs of Donetsk, using the whole range of weapons, from small arms to 122-mm artillery. Several shells landed in the residential areas of Maryinka. No-one was hurt, according to preliminary reports. The militants used mortars near Shyrokyne, Vodyane, infantry arms in Hnutove and Lebedynske. Avdiyivka and Kamyanka were the hotspots in the Donetsk sector. In addition to small arms, grenade launchers, 82-mm and 120-mm mortars, the militants used tanks. A total of 35 shooting attacks by pro-Russian militants were registered on 30 June.